← Fashion Revolution: Who Made My Clothes? All the cute outfits in the world aren’t worth it if you don’t feel good. For me, feeling good starts on the inside, with a healthy vegan diet and plenty of sleep. Physical activity is crucial too. I’ve always enjoyed being active. The gym is a chore, but hiking, biking and roller derby have held my interest. Recently, I discovered Pure Barre. It’s a fantastic antidote to my desk job. 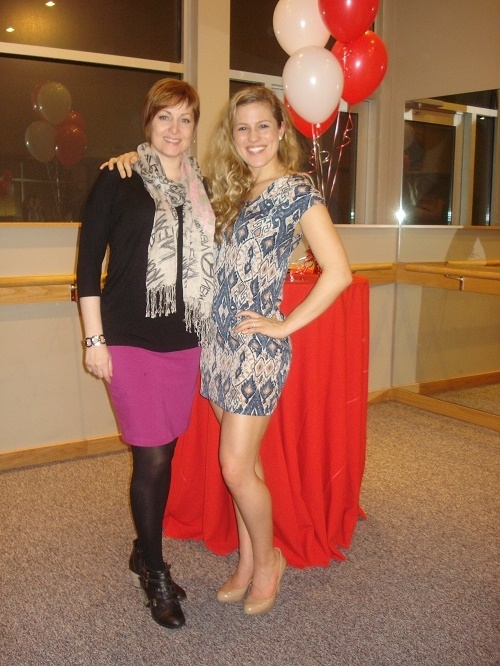 Here I am with Hanna, one of the inspiring Pure Barre instructors, at a recent open house. Pure Barre is a challenging workout that uses a ballet barre, stretching, strengthening, and isometric poses. I went when a friend invited me to a class and I thought, “how hard can it be?” Was I in for a surprise! It’s a workout great for all ages, body types and skill levels, but it isn’t easy! I worked muscles that hadn’t had a lot of use, and I felt it! Classes focus on working abs, seat, and thigh, and there are upper body weight components too. The goal is a strong, lean body. The first class left me sore (in a good way) for days. I knew this workout would change me so I signed up for more. Now, a few months in, I see results! I have obliques. My abs are flatter. I have more defined quads. I can do “real” push-ups, and a 90-second plank. I love that class is still challenging and that I will always be able to improve and grow. If you haven’t heard of Pure Barre, here’s an intro from their site. There are over 300 studios in 42 states. Your first class is free, so why not try? You look fabulous Jean! Nice scarf and bracelet.